Calling all friends and family!!! This spa perfect for connecting to the people who matter most. The Serenity 5000 is an 5 Person Spa that features roomy seating for 5-6 people and has a swing seat for the lounger in the family. This hot tub also has easy access non-slip steps built right into the interior of the hot tub. All designed and engineered to provide total comfort and performance. This hot tub is well equipped with many standard features. This hot tub offers ergonomically designed seating for full body support with soft comfortable pillows that gently support your head and neck, while the seating cradles your body with wide lumbar support. Serenity’s unique “Versa massage” hydrotherapy system adds the final touch, massaging every inch of your body. 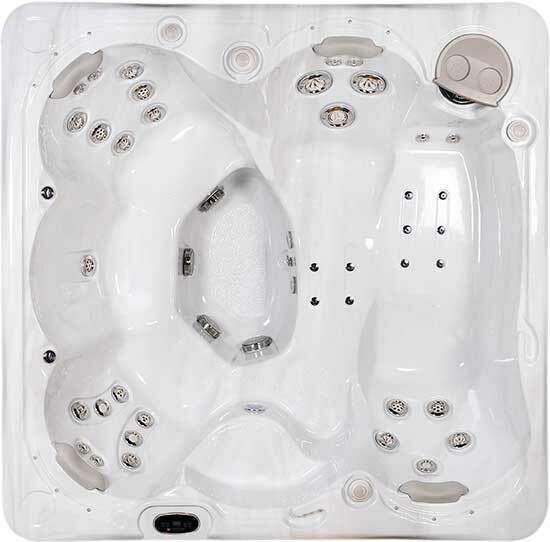 This Serenity Hot Tub boasts 40 jets (Platinum Series) offering a broad variety of stainless steel jet sizes and types from powerful wide body streams to penetrating finger tip massage, each jet individually adjusts to deliver optimum hydrotherapy.